I am not a cook. I’m the daughter of a cook. And a baker. I grew up in a restaurant. But I’ve not inherited the genes that make one skillful at knowing what spices to combine with what bases. I tried to make a chocolate strawberry tart and the hubs needed a butcher knife to cut it. And so, in our household, it is my partner, Joe, who does the cooking. And I remain ever grateful. But we’ve challenged ourselves to do things a little differently in our partnership and I’ve started making one meal a week with the goals of being health conscious and tasty. Like a good little wi-fi (my husband’s nickname for me given my love of social media), I trolled pinterest for some recipes that looked good, easy to make, and were healthy. That means I was steering clear of recipes with a lot of dairy, red meat, or carbs. Here’s what the past 2 months have brought about. *Note: All photographs are my own. 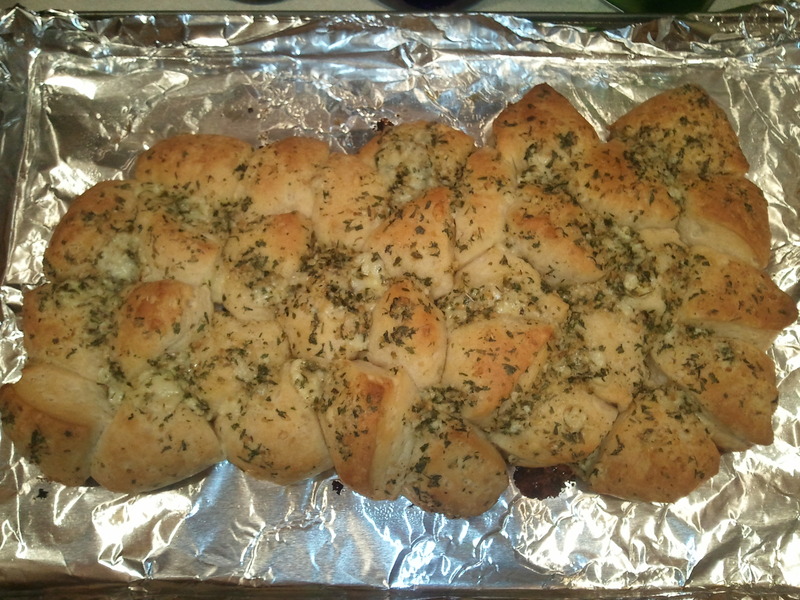 I thought you should see what the food looked like when an amateur attempts to pinterest at home. Bon appetit! Featuring the 30 Best Buddha Bowls, Yummy Mummy Kitchen included a winter bowl with curried chickpeas that I adapted at the end (scroll to the bottom of her post). I made the chickpeas as she described, then played around with my own vegetable options. I sautéed rainbow carrots and brussel sprouts in olive oil, ginger, and cumin until tender. And I added marinated beets and a thai cocount curry hummus which I purchased from my co-op to the top of the bowl. Everything was dumped on a bed of spinach. It’s a nice mix of sweet, spicy, creamy and tangy. I am not the best burrito roller, but halfway through I got the hang of it! This dish was really filling and nice for leftovers. Our favorite part was the cilantro lime sauce. Bonus, the recipe from Ceara’s Kitchen is also vegan, so if you’re looking for some meat-free meal options, this one’s good. Alright, so pancakes aren’t exactly at the top of the health food menu, but it was the weekend and I wanted to do something special. Plus we’d received super yummy Canadian maple syrup from my brother’s family as a thank you for dog sitting so pancakes were really the only option. This recipe from The View From Great Island is a very delicious lemony treat and goes great with fresh blueberries and turkey bacon on the side. *Notice my absolute lack of skill in pancake flipping. I made Lemon Poppyseed Pan-shmooshes. When the chef preparing this dish says she eats chicken tikka masala multiple times a week, you know you can trust the recipe to be pretty good. 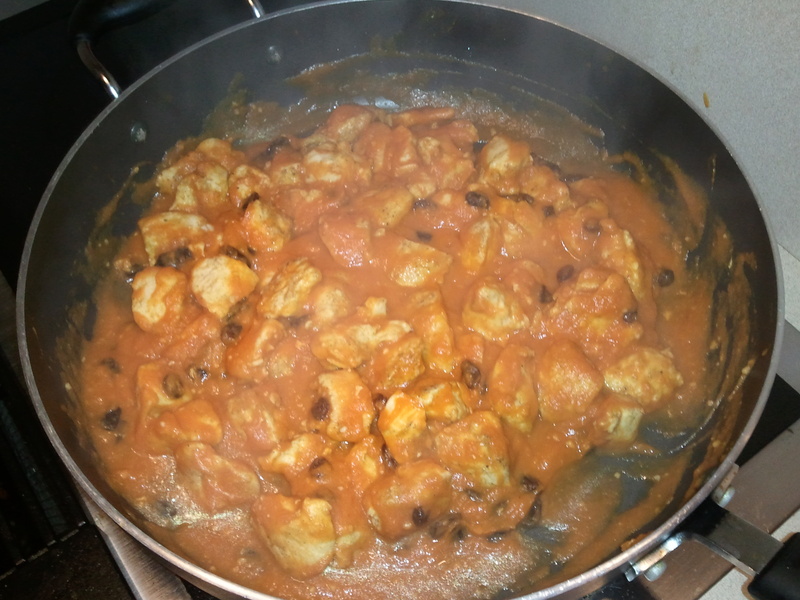 Found on Savory Tooth, this chicken tikka masala recipe was indeed, tasty. This recipe requires an Indian spice blend called garam masala, which for those of you who live in a smaller city, could be hard to find. You can buy it online, but I was lucky enough to find it in the bulk aisle of my co-op and prepare my own baggie full of the spice. Buy extra, cause the next recipe calls for it too! I have absolutely no idea why this recipe is called Butter Chicken when there is, in fact, no butter in it. But for folks who like spice, then this dinner from Damn Delicious is the ticket. It’s extra spicy if you pair it, as I did, with Fooduzzi’s recipe for Sriracha Almond Butter Roasted Brussel Sprouts. Zing! If you’re trying to cut out excess carbs too, you can put the chicken over a bed of chopped spinach instead of rice like we did, and sprinkle with cilantro. From The Endless Meal, this recipe for thai chicken soup, which simmers in a crockpot for eight hours was DELECTABLE! Red curry paste mixed with chicken stock and coconut milk makes up the broth. 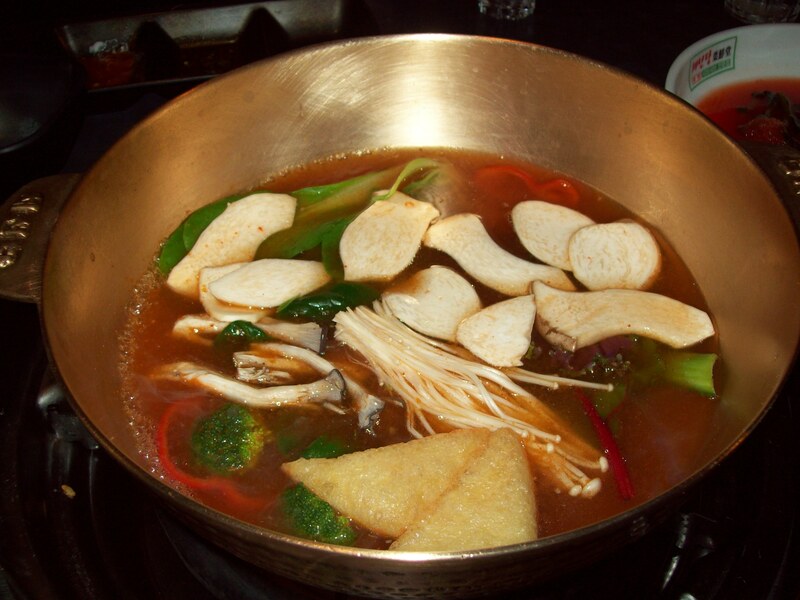 Add chicken, plus whatever vegetables you want, and rice vermicelli noodles – which cook in 2 minutes! For veggies this time, I used red pepper, onion, mushrooms, and tomatoes. So savory and even the leftovers are delicious. And the other hit was Roasted Chicken with Vegetables from The Cookie Writer. Another easy one pan meal – hooray! The cook behind this recipe saved time by buying chopped veggies from the grocery store, but I did my own chopping with what we had on hand already. I substituted chicken breasts for the bone in chicken, since we had 3 frozen chicken breasts to use up. And the veggies I cut up were cauliflower, green pepper, and baby carrots. My hubs loved the paprika and basil spice blend. There you have my adventures in the kitchen. It’s not going too bad! What are the recipes you love and return to? See any on this list you might try? 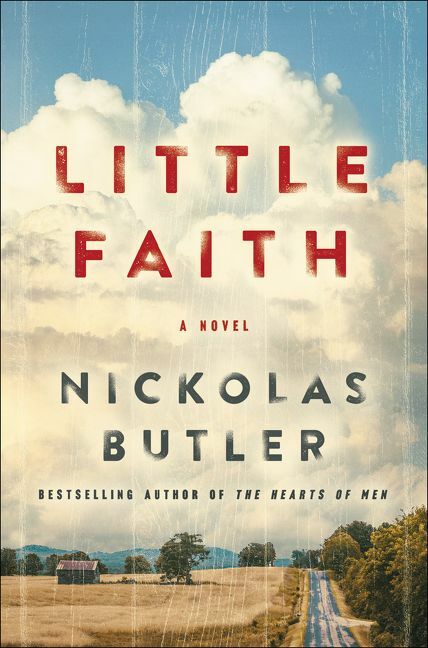 I know, I know, I’ve been completely MIA in the blogosphere this season! Forgive me. I work in retail. You won’t see me in full swing until January. 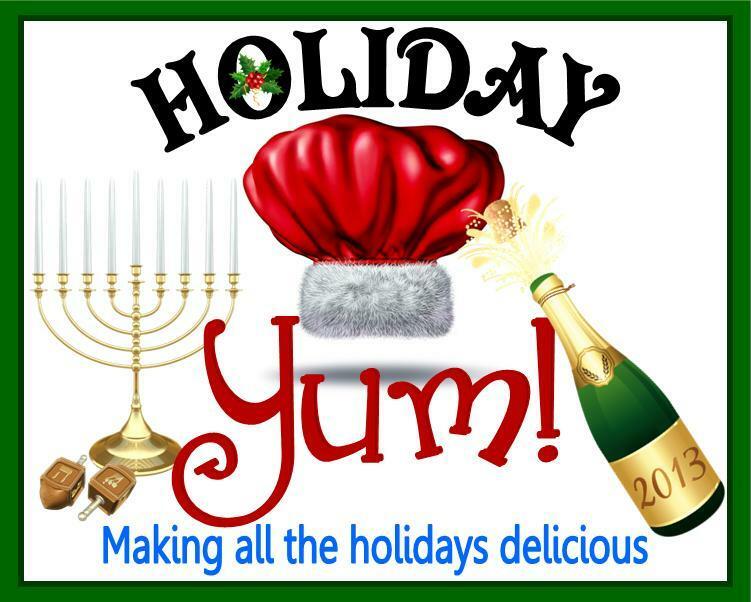 See the Full Holiday Yum Schedule – Tasty Treats You Won’t Want to Miss! 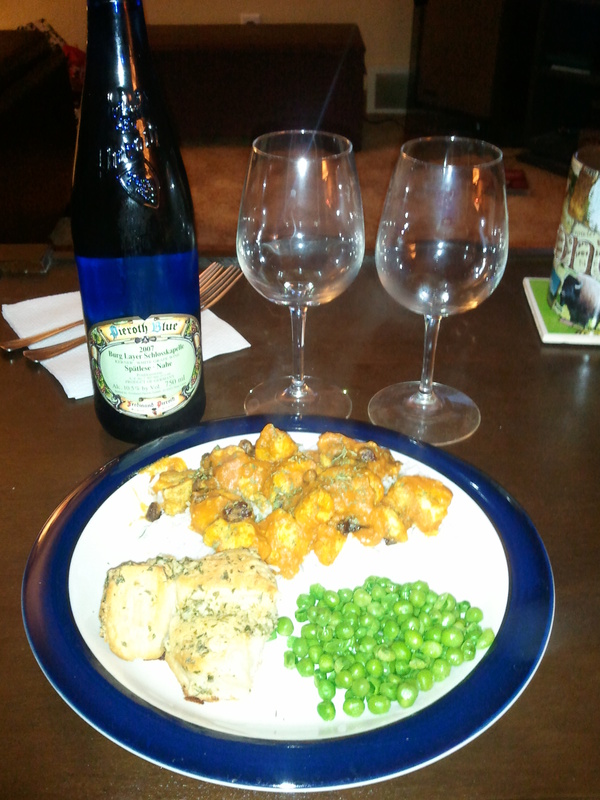 On November 17th, Jenny Hansen kicked off the hop with her Gluten-Free Thanksgiving Meal. There are lots of great tips for folks who need to eat GF, including some sneaky foods to watch out for! On November 19th, I shared the salty-sweet, super-easy Spiced Pecans appetizer. Ellen M. Gregg has us all drooling with The Chocolatiest Chocolate Cake – Evah on Monday, November 26th. Jenny Hansen introduces us to her luscious Almond Roca, famed of song and story, on Wednesday, November 28th. Estee Lavitt shares her mouth-watering Baked Latkes on December 2nd, just in time for Chanukah! Natalie Hartford starts us off on a cookie binge with her fabulous French Lace Cookies on December 5th. Mais Oui. I’ll be back on Dec 10th with a Christmas cookie staple that’s yummy and versatile – butter spritz cookies. And if those last two posts aren’t enough “cookie” for you, Ellen M. Gregg will also be making her Old-Fashioned Buttermilk Sugar Cookies, along with Bulldog Punch, on December 14th. Natalie Hartford continues the yummy sweets with her favorite cheesecake recipe on December 17th. Jenny Hansen teaches us not to fear candy-making with her super-easy, super-yummy Holly Candy recipe on December 19th. Jess Witkins is still plotting and planning, so we will either be treated to a comfort food or appetizer recipe on December 23rd. On December 26th, I’ll be posting about my super-easy beef rib-eye roast with currant jelly brown gravy that I make every year for Christmas dinner. Hope my holiday guests don’t mind me taking more pics of the food than of them, LOL. Today, I’m sharing a comfort food dish that I tried this year and loved! And working in retail, I’m all about the little comforts when I get home! If you wanted to make this again, that’d be alright. But don’t take their word for it! Try it yourself! Cook rice according to package directions. Meanwhile, sprinkle chicken with 1 tsp. curry powder and pepper. 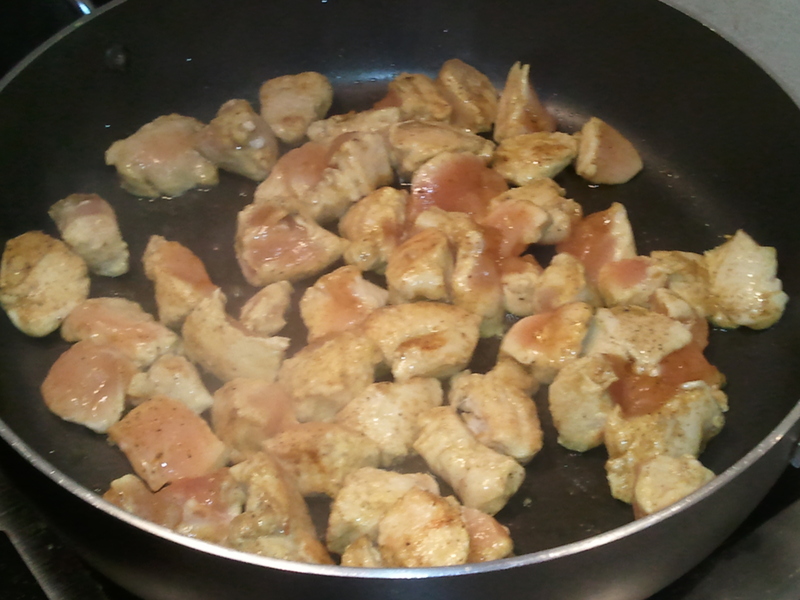 Heat oil in a large skillet; saute chicken for 5-6 minutes or until no longer pink. Add garlic; cook 1 minute longer. Stir in pumpkin, broth, raisins, apple butter, five-spice powder and remaining curry powder. Bring to a boil. 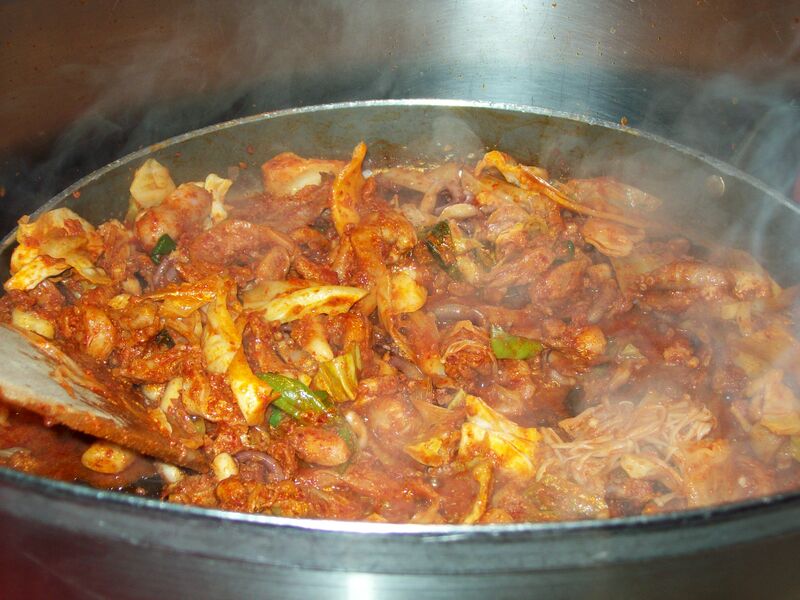 Reduce heat; simmer, uncovered, for 5-7 minutes or until heated through. Stir cashews into rice and serve with chicken mixture. Sprinkle with parsley. Separate biscuits; cut each into quarters. Arrange into an 11 inch long loaf on a greased baking sheet. In a small bowl, combine the remaining ingredients; brush over loaf. Bake at 375° for 18-20 minutes or until golden brown. Voila! 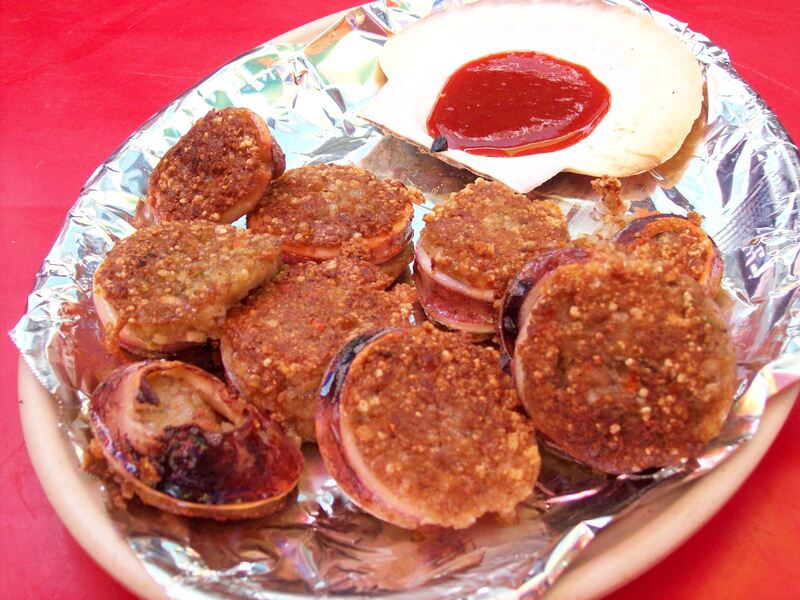 Gourmet comfort food without all the fuss! Cheers to you and yours this holiday season! May each of you celebrate with all those you love, and take a little comfort in some homemade treats! All of us have our favorite foods, delectables, and comfort dishes. And of course it’s fun to try new foods too! 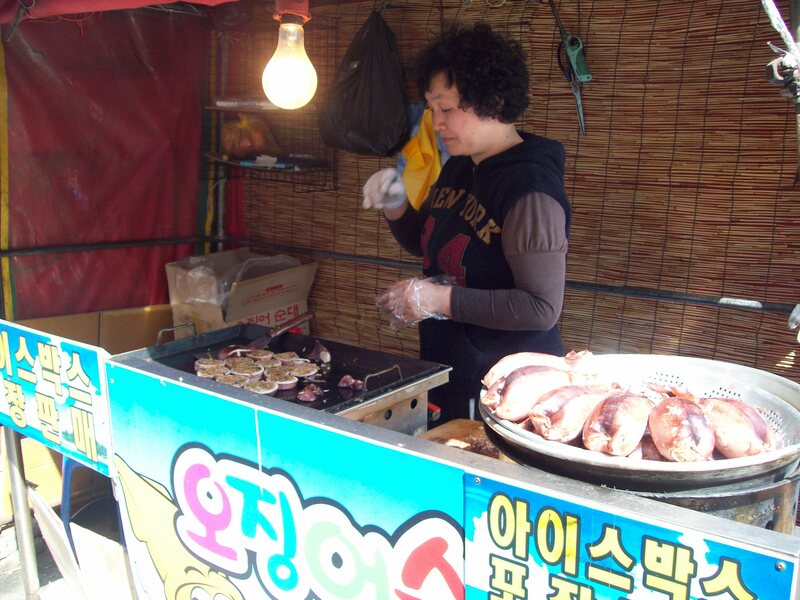 Here are some of the dishes I tried while visiting South Korea. Twiggem is any kind of fried food. My first night in Seoul we walked through the streets and alleyways till we found a little spot with a large assortment of twiggem to try. Each guest is given a basket to fill with whatever they’d like to try, then it’s weighed and you pay by the pound. *Don’t think too hard about it! 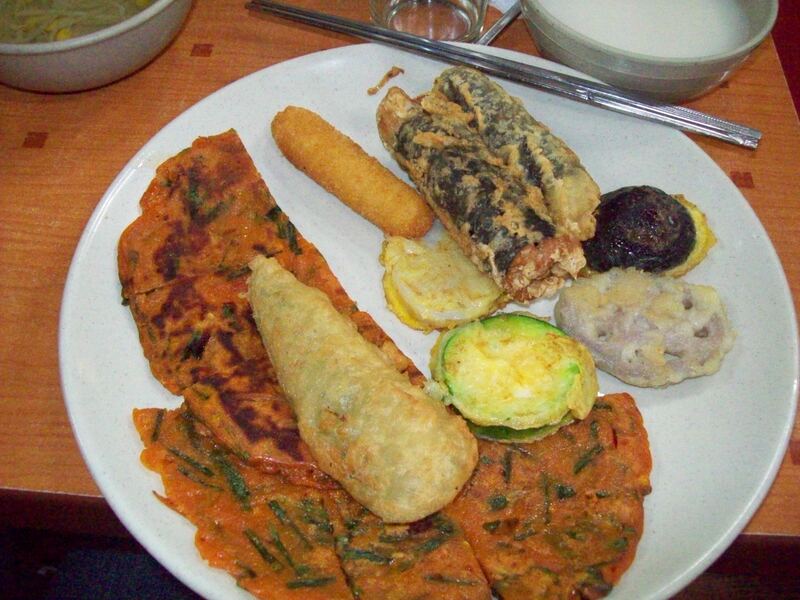 * I tried fried kimchi, mushrooms, fish, leaf wraps with rice and ham, fried zucchini, and fried lotus root. My favorite dish! 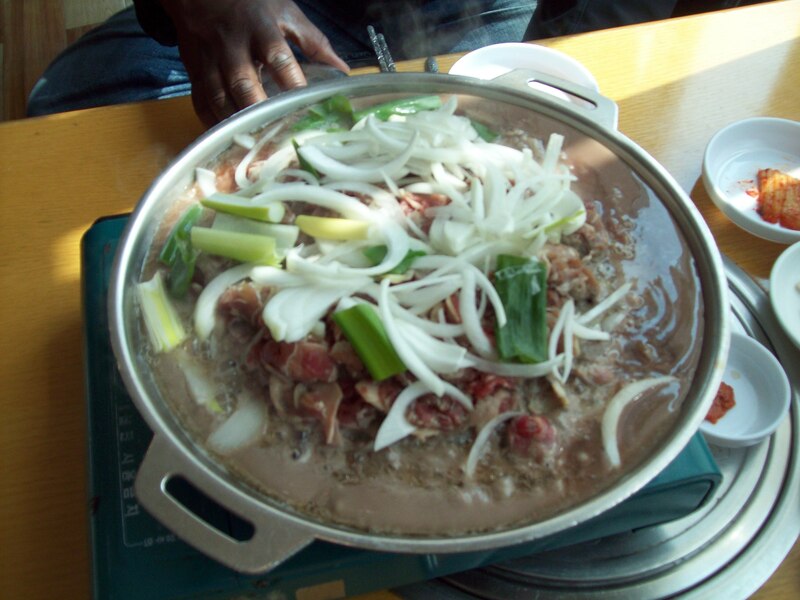 Bulgogi is Korean barbecue. It’s cooked right at your table in a broth of vinegar and soy sauce with some pear zest in it. Add onions, mushrooms, and leeks. I ate it twice while on my travels and with it was served an assortment of green leaf salad, kimchi soup, a wasabi slaw salad, glass noodles with chilis and nuts, fish, and more kimchi (cabbage in a vinegar/chili sauce). 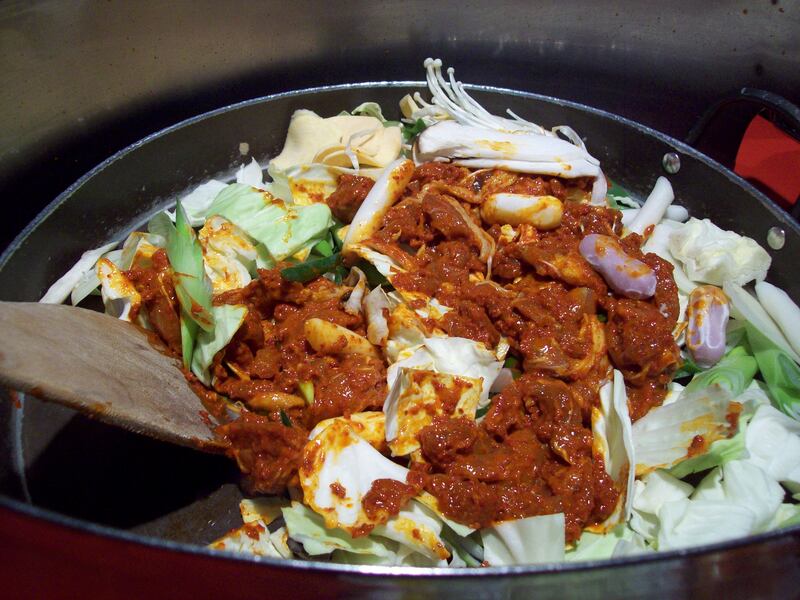 Shabu Shabu is a Korean take on a Chinese Hot Pot. 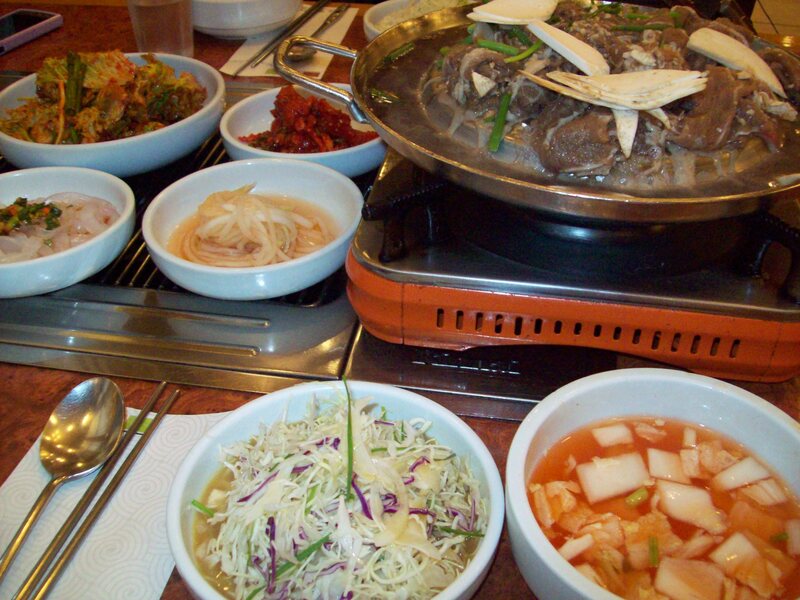 It involves a pot of boiling broth brought out to your table and an array of foods that are cooked in the broth. We tried everything from meatballs to beef slices, various greens, a whole plate of different mushrooms, peppers, rice cake, broccoli, and dumplings. At the end, the remaining broth is mixed with rice and a fried egg, which was tasty but I barely had any room left! The octopus awaiting the fry pan! 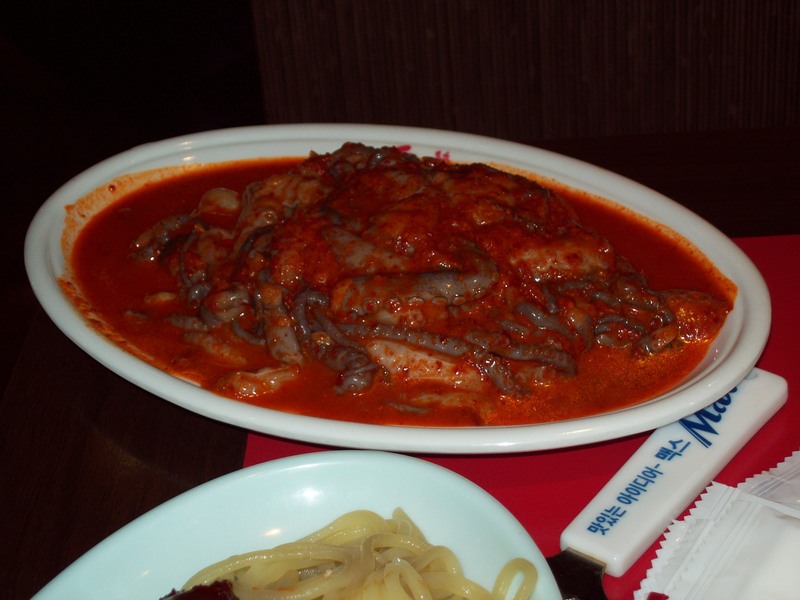 The Dakgalbi After: Tentacles and All! My first bite of octopus! My first experience with Korean desserts. 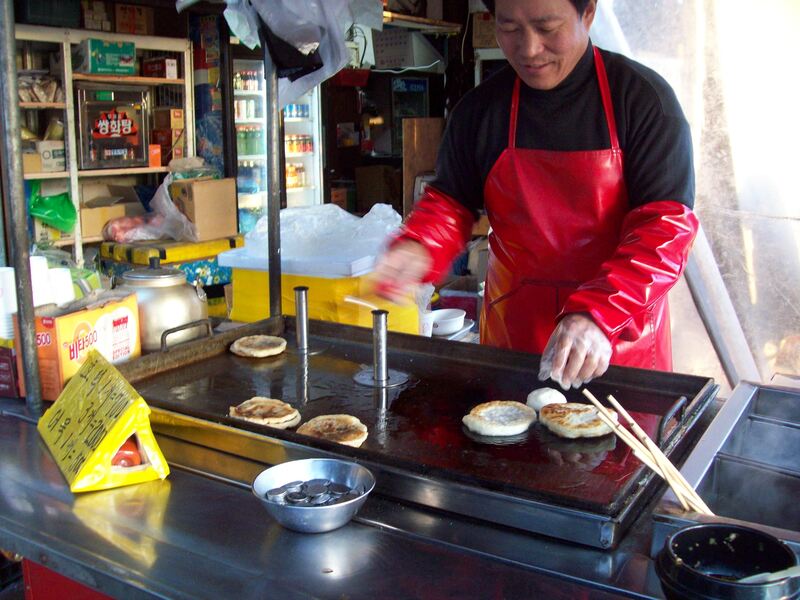 Hotteok (pronounced Ho-duck) is dough filled with brown sugar and nuts and fried till slightly crispy on the outside. Mmmm. 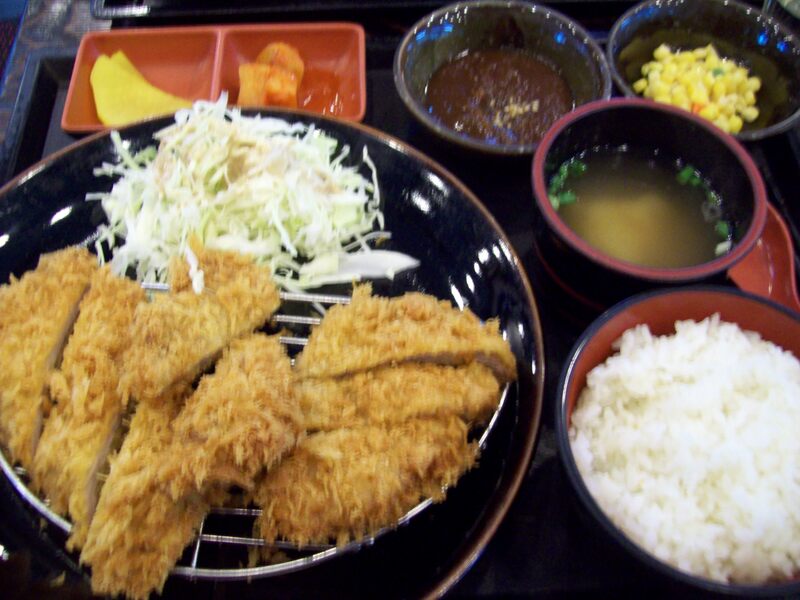 Doncasu is pork cutlets, breaded and fried. 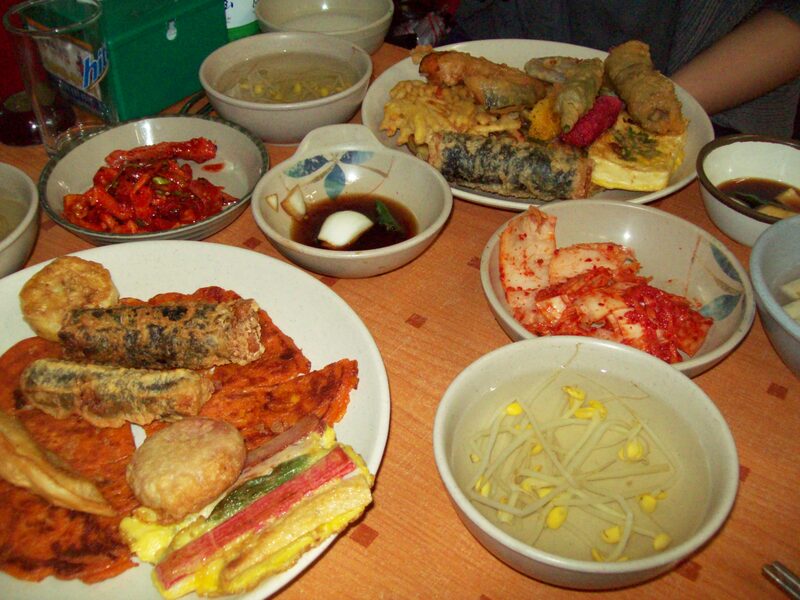 The side dishes with it included rice, corn, soup, and a spicy sauce. 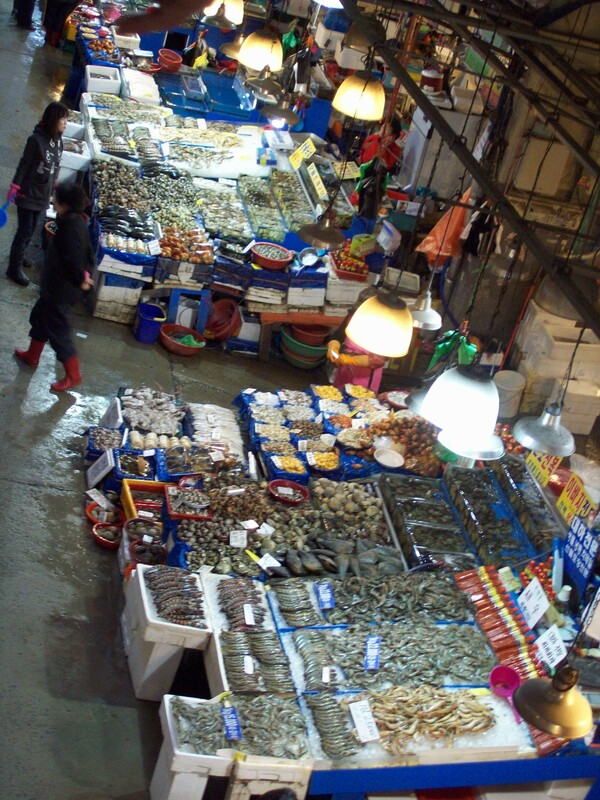 The top left dishes hold different kinds of radish which are common sides that have been pickled and will cut the spice of the main dish. One of the vegetarian dishes I tried. 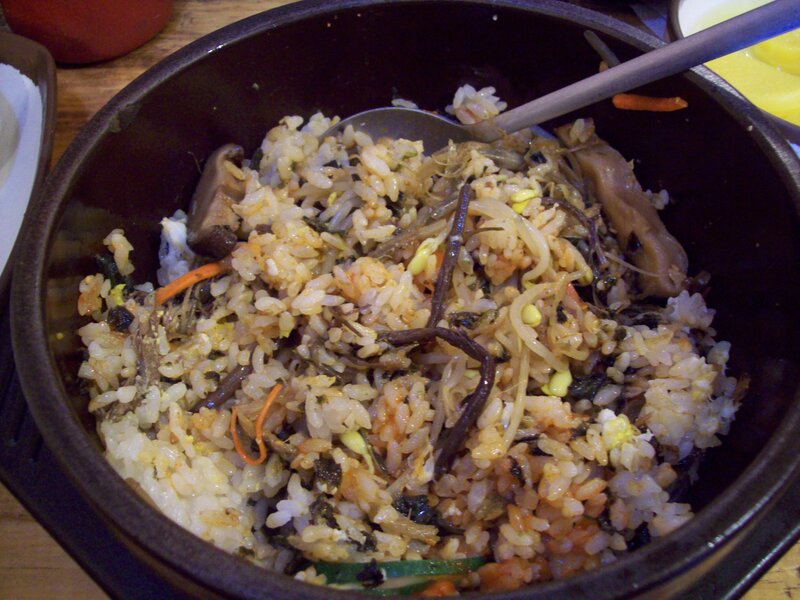 Bibimbap is rice and fried egg with various mushrooms, zucchini, carrots, corn, sprouts, and seaweed and a hint of a chili sauce that you mix up. Yum! Ahh, for Easter Sunday, my lunch was ojinga sundae! 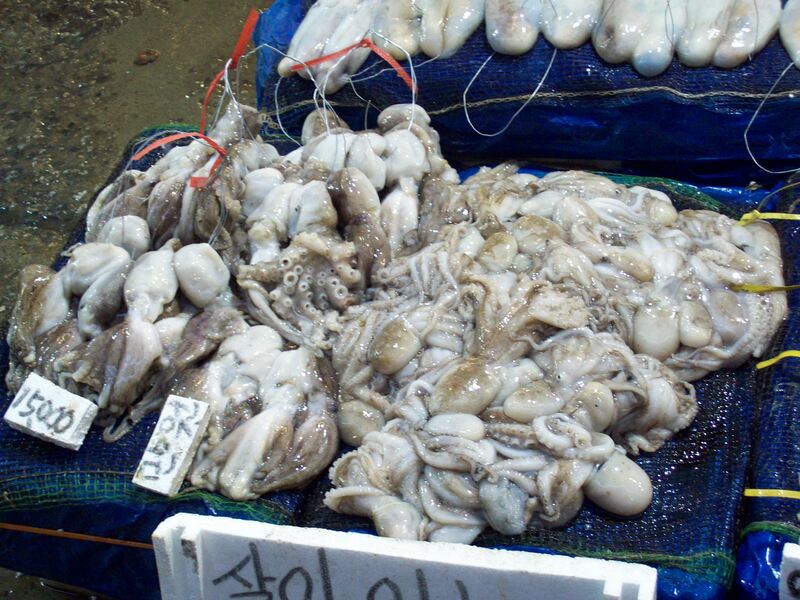 Literally it translates as “squid sausage”. 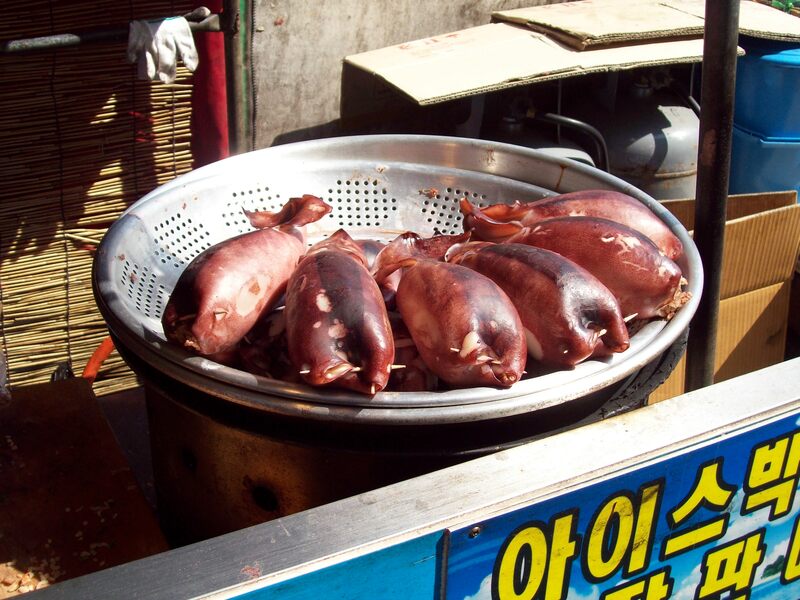 It’s squid head that’s been cut off and scooped of any organs, filled with rice and vegetables or glass noodles, then breaded and fried. Messy, but very tasty! 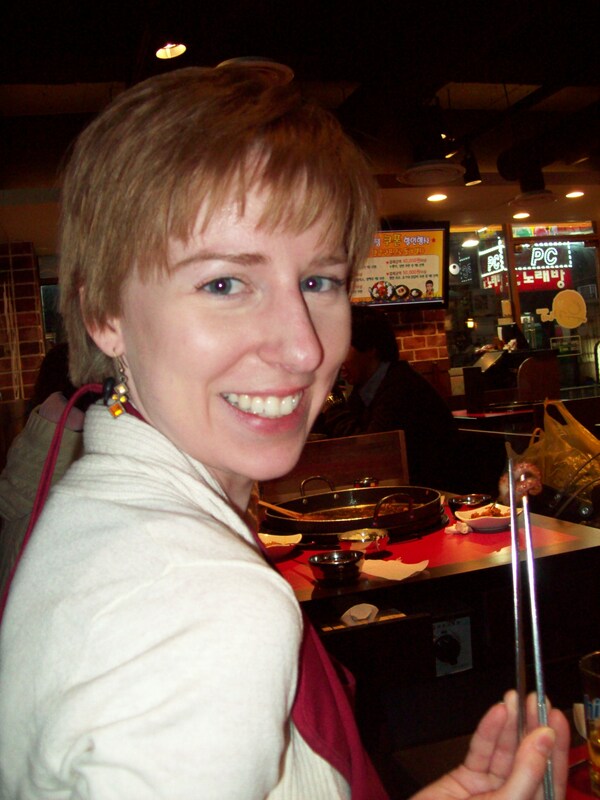 Those were my food adventures while traveling overseas. But tell me about your favorite food experiences! When was the first time you tried something out of the ordinary? What are the foods you love? What foods can you NOT stand? What does your guilty pleasure plate look like?